The Pittsburgh Penguins closed out the San Jose Sharks on Sunday night, winning 3-1 in Game 6 to capture the 2016 Stanley Cup — the fourth in franchise history and the first since 2009. After beating the Rangers and the Capitals to advance to the Eastern Conference Finals, the Penguins beat the Tampa Bay Lightning in seven games to reach the Cup Finals. There, they raced out to a 3-1 series lead and, after failing to close out the Sharks on their home ice, won in San Jose. In Game 6, Pittsburgh led 1-0 after the first period in Game 6 behind a Brian Dumoulin power-play goal. The Sharks tied things up at 1-1 when Logan Couture found the back of the net early in the second, only to have the deadlock quickly broken when the Kris Letang gave the Penguins a 2-1 lead less than two minutes later. 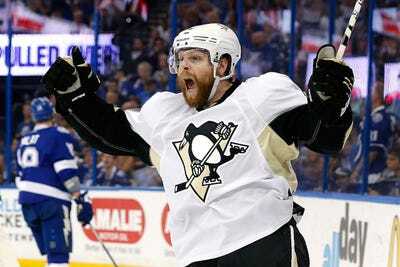 The score remained deadlocked at 2-1 until late in the third period, when Patrick Hornqvist buried an empty-netter to seal it.